We’ve just returned from a whirlwind trip to Beijing, visiting Tiananmen Square, The Forbidden City, Temple of Heaven, and of course, The Great Wall. Here’s a few general observations and helpful pointers to prepare you for this amazing, crazy, ancient city of over twenty-four million people. We arrived fresh off of the Shanghai bullet train into the chaos of a Beijing rush hour. Deciding to take the affordable and very convenient subway to our hotel, we found that while navigating the bustling station was made easy with English signage, the lack of elevators and even downwards-going escalators made lugging our baggage a real pain. Many stations we encountered during our stay only had upwards-going escalators, so if you’ve got any sort of mobility issues, (or intend to bring a pram or stroller), just know you’ll be dealing with two, three, even four story staircases. Read our China travel bucket list here! The Beijing Subway is fast, affordable, and convenient. Station signage is offered in both Chinese and English. While taxi drivers are likely to (literally) take you for a ride, (charging more or running up the meter), the Subway is really the best way to get around the city. Just remember that there are 22 different lines, and over 370 stations. Plan your outings, map them ahead of time, and make sure you count heads & any belongings every time your group enters or exits a subway carriage. 3) It’s Gonna Get Dirty. Beijing suffers greatly from dust. You’ll see it on everything from the cars, to window sills, to sidewalks, to your feet. Primarily blown into the city from Mongolia, this dust can create quite an issue for anyone with asthma, so purchase a face mask in any local pharmacy to prevent problems. Dust also easily gets into eyes, especially on windy days, so plan to keep sunglasses on while out in the streets. 4) Temps Can Rise and Fall Greatly In Spring/Autumn. During our May visit, temperatures soared to 35C, (95F). However, just a few days prior to our arrival, temps were in the high teens, (60’s). Be sure to pack lots of layering options, so you’ll be ready for whatever Mother Nature has in store. Ok, yes they do exist, but nobody cares to stop for pedestrians…even in a zebra crossing. Even at a red light. We thought we’d already seen it all, having navigated Ho Chi Minh’s (Saigon) crazy streets, but this place really takes the cake. Bikes, motorcycles, cars, and especially buses will all just cruise on through any and all pedestrian crossings, so be prepared. Look both ways, as your Mother always advised, and KEEP LOOKING all the way across. If you’ve got small children along, it’s probably best to just carry them. Good luck…you’re gonna need it. Most public bathrooms will not have soap, so pack your own antibacterial gel. Many public bathrooms will not have toilet paper, so pack your own tissues. Riding in a car or bus in Beijing is not for the faint of heart. All road rules you know just go straight out the window here. Be sure to buckle up, and try to enjoy the sights. Keep your eyes on those amazing sights…not on the stuff going on all around you on the streets. Be prepared to have a few grey hairs come in afterwards. 8) Stay Local, For A More Memorable Experience. 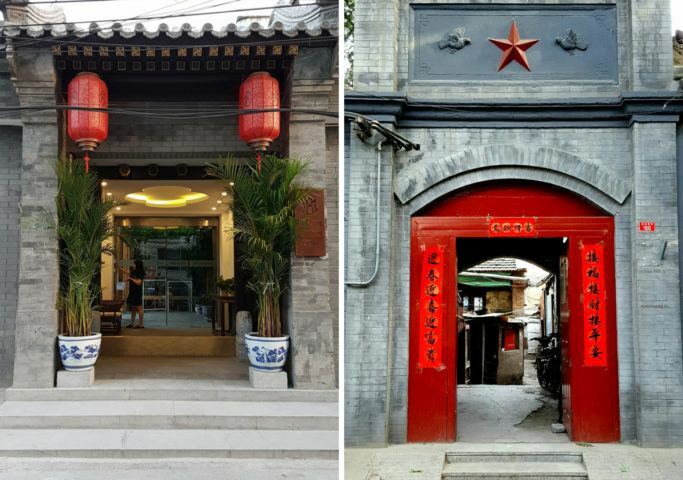 Avoid the big branded hotel chains and opt for a more unique and historical experience by booking into a Hutong hotel or hostel. Hutongs are the ancient neighbourhoods of Beijing, and really give you a feel for local life. Residents are welcoming and friendly, overall. There’s something at every price range, and many are located within walking distance of The Forbidden City. Check out https://www.161hotel.com/ as one option. 9) Visit Tiananmen Square & Forbidden City. Plan a whole day, even two, just to cover these. Jump off of the Line One Subway at Tian’anmen East Station, and use exit B. Just a quick 5 minute walk and you’re there! You can view Tiananmen Square from across the major roadway, or cross over to stroll there. The main entrance to The Forbidden City is also right here, so you can get your entrance tickets and head on in. On the far end of The Forbidden City, it’s a bit of a different story. The closest subway stations are about a 25 minute walk, so either be prepared to hike or pre-book transport back to your lodging. Taxis are sure to scalp you here. 10) It’s Called Great For A Reason! Ok, about this Wall….If you’re just interested in saying you’ve done it, go to the Wall site closest to the city, which is Badaling. But, as this is the easiest to get to, it also has the largest crowds. Get in, get out, go home. However, if you’re wanting to REALLY get a feel for just how awesome The Wall can be, you’ll want to book a tour (either online or through your hotel), to Mutianyu, which is about 1 ½ hour’s drive from the city. You can also opt for a private hire car, but be sure to barter, as agents will try to get you to pay for an all-inclusive tour, meaning big lunch, etc. At upwards of US$ 250. for this, just tell them you’ll bring your own snacks and water, (as we did), and save yourself some money. Everything is negotiable. Once you’re at the Mutianyu site, purchase a one-way cable car ticket up to The Wall, point 14, then walk downwards on The Wall to point 6, (approximately a mile),where you can then choose to either hike down to the entrance area, or purchase a ticket to ride or toboggan down. Yes, you did read that right…you can slide down to the entrance in a toboggan. Mutianyu is spectacular, The Great Wall stretching across the steep ridges for miles and miles. Go as early as you possibly can, to avoid any crowds and to get your most perfect Instagram shots, if that’s your thing. 11) Book A Local Guide. I’m lucky, as my husband speaks fluent Mandarin. Even so, we did find touring Beijing to be somewhat challenging, to say the least. If you’ve got plenty of time, and patience, then you should do just fine. However, if you’re on a tight schedule to see as many of this ancient city’s offerings as you can pack in, book yourself a local guide, such as those offered by GoGoMate , to ease your way quickly through all you want to see. 12) Yes: WiFi. No: Everything You Use It For. Most of China blocks apps such as Google, Outlook, Facebook, Instagram, Messenger, and so on. Before you go, it’s a good idea to let any of your loved ones know that you’ll be somewhat out of touch. (Skype works well, if you do need to connect with the folks back home). Many hotels offer rental smartphones loaded with Hong Kong SIM cards, so you can access the aforementioned apps you customarily use. Renting one of these phones will also give you Google Maps, which is a godsend in the tangled, busy streets of the capital. Beijing is an astounding, (and sometimes confounding), step into China’s glorious past. Plan ahead, and you’re sure to make the very most of your special time there.